An easy to learn from, watercolor painting e-Book that will bring your work closer to the professional level. Inside, you will find a detailed demonstration of a new and exciting 7 stages multi-layer watercolor painting technique that teaches you how to create realistic and convincing 3-dimensional rose flower that reaches out of paper to meet you. It will show you how to start, how to paint along and how to fine tune it and know when your painting is finished, while building the knowledge and confidence to paint any subject you choose to paint next. In this book, Lela takes you step by step through her process of creating a glorious rose watercolor from start to finish. Learn the reasons behind every brush stroke Lela makes. Learn how to identify and analyze light and shadow areas, avoid common mistakes and how to make your color washes glow with life. It's just like watching over Lela's shoulder while she paints! •Lela's 7 stages creative process for painting watercolors based on the proven techniques of the Old Masters. •Essential painting concepts such as light and shadow and watercolor painting techniques - clear water single and double wetting followed by color application, clear water softening layer, softening the painted edges and dry brush. •A list of all needed tools & material including a recommendation for a well-balanced color palette - which is of the highest quality, transparency and vibrancy. 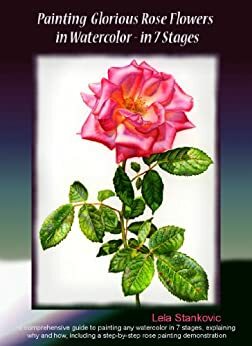 •A step by step painting demonstration of a beautiful rose - which gives you the skills to paint any subject.